season 20 | Randomwhoness: a Doctor Who blog by Johnny Spandrell. Sampling stories in random order. In the middle of the otherwise straight-laced Davison era, lies Snakedance – an exotic, experimental and slightly deviant experience. It feels like an illicit treat, like a sneaky spliff before heading back into English class, focussing on Eliot or Blake. It’s got much to say about expanding your mind to see the true nature of things. But let’s start with its most famous scene, which focuses on an elaborate but mysterious hat. It’s a hat from the old times of the planet Manussa and it’s in the possession of this planet’s chief fusspot Ambril (John Carson). The hat features five sculpted faces in an outer orbit around its crown but is confusingly called “the six faces of delusion”. Not even Ambril, an antiquities scholar, knows why. It’s left to the Doctor (an excitable Peter Davison) to point out that the missing sixth face belongs to the hat’s strong necked wearer. Ambril, who had put the numerical discrepancy down to his ancestors’ inability to count rather than their ability to balance oversized headwear, is outraged to have this pointed out to him and orders the Doctor out. Critics of this scene have mentioned that it’s a pretty obvious conceit and it’s surprising that Ambril and his fellow Manussans hadn’t worked it out themselves. Fair enough, but it’s also saying something else about them: that their minds are closed to symbolism, metaphor and nuance. Snakedance tells us that the Manussans are a decadent, complacent people, but that scene shows how bereft of imagination they are. They are blind and deaf to the threat of the return of the Mara – the ancient evil that once dominated their planet – because they can’t conceive of it happening. Just as they can’t imagine a situation where five faces can become six. They cannot open their minds to the possible. Opening one’s mind to new possibilities and engaging in mind altering experiences to see the truth of things are at the heart of this enigmatic story. It starts with a dream, in which companion Tegan (Janet Fielding) has a premonition of arriving at the snake’s head cave on Manussa where the Mara will attempt its return. Later, the Doctor will hypnotise her and have her regress to childhood in order to confirm his diagnosis that the Mara is resident insider her head. In both these states, it’s shown that the only way to reveal the Mara is to suppress your own ego and enter into a subconscious state. Once on Manussa, Tegan is mentally overtaken by the Mara, as she was in Kinda, this story’s prequel. Possessed companions are standard Who fare, but Tegan’s is something different because the Mara’s presence suggests not just suppression of her personality but an amplification of darker characteristics lying latent with her. This makes the Mara a uniquely disturbing creation: greed, lust, envy, wrath are all magnified by the Mara. It makes Tegan’s experience feel like a genuine expansion of the mind, although in a deeply malevolent way. And to reinforce that this mind expansion opens up new ways of seeing things, there are symbols of distorted perception dotted around, like crystal balls and fairground mirrors. Altering your mind also eventually proves to be the only way to prevent the Mara’s physical return to Manussa. This is the only Doctor Who story to place mystical, almost heroic significance on the “dropout”; the person who turns their back on society to travel into the wilderness, and search for life’s essential truths. Maybe with the help of drugs; the image of a mind blowing trip in the isolated wilderness seems to be what the snakedance actually is. We only ever see one snakedancer, Dojjen (Preston Lockwood) and we never truly meet him. He turns up in a series of unexplained close ups which are dotted through the story and reappears at the end as the Doctor’s spirit guide to chaperone him through his own bender. Dojjen used to hold the same position as Ambril, that of dusty historian and bureaucrat, but he dropped out of Manussan society to wander in the desert. Ambril dismisses Dojjen as a “crank”, one who “decided his particular line of research was best pursued up in the hills with a snake wrapped round his neck.” But Snakedance positions Dojjen not as a spaced out loon, but as the wise man from whom the Doctor must seek advice. He’s a bit like K’anpo in Planet of the Spiders, except that Dojjen is completely outside the establishment, and he’s a drug user. OK, so he doesn’t actually drop acid but his drug is the venom of the snake and he convinces the Doctor to sample it as well. And so we have the only Doctor Who story where the Doctor takes a mind altering substance in order to solve the story’s problem. The insight the Doctor gains from the experience is to find the “still point” within himself. When the Doctor returns to the snake’s head cave to confront the Mara, he finds dozens of Manussans in thrall to it, paralysed as the Mara feeds off their mental energy, in order to take corporeal form. The question is how to prevent it and the answer, again, is to change mental states. It’s never fully explained what the still point is, but what the Doctor seems to do at the end of Snakedance is to meditate, to eradicate conscious thought and therefore starve the Mara of the energy it needs to fully emerge. All around him, the gormless, weak willed Manussans are entranced by the Mara, unable to clear their minds and disbelieve it out of existence. Again, they lack the ability to open their minds, to mentally adapt to the world around them, which has suddenly got very dangerous very quickly. This is why, I think, Snakedance is such an intriguing story. But it’s also a languid one. Its big moments are not action sequences, but ones which focus on characters changing their consciousness in order to expand their perception. They are personal, internalised events. In fact, the standard Doctor Who runaround bits – your chases through market places, dashes back to the TARDIS, the interminable Part Three lock up – are its least interesting segments. It’s a story hampered by having to remember to be Doctor Who, as reinvented in 1983 as a cut-price action adventure serial. But despite all of that, writer Christopher Bailey manages to slyly – even covertly – tell a story with a deeply Doctor Who moral: a lack of imagination leads to stultification and corruption, but open your mind and you’ll be enriched and rewarded. Plus you’ll know how to interpret a mysterious hat. So there’s that too. LINK TO Thin Ice: fairgrounds and tattooed men. NEXT TIME: It’s reality TV gone feral in Vengeance on Varos. And cut it… there! Forgive me Terminus fans (yes, both of you, haha) but I’m not quite finished with City of Death. On that DVD’s “making of” featurette, a number of Who luminati line up to talk about how great the story is, but when it comes to Douglas Adams’ stint as script editor, their reviews are decidedly mixed. The consensus seems to be that he was a prolific generator of good ideas, but didn’t understand story structure. That anyone can say this with a straight face on a documentary about City of Death is slightly bewildering. Apart from a few languid breaks for sections of travelogue footage around Paris, that story is one of the most tightly plotted the show ever produced. And while we’re about it, think about the rest of the stories in Season 17. Despite any of their other pros or cons, they are all well structured stories, well told (save for, perhaps, The Creature from the Pit, with its odd narrative dogleg in Part Four). Sure, these were written by some of Doctor Who‘s old hands, but they’re shaped and formed by Adams. If he really is shaky on story structure, I see little evidence of it in his year as script editor. Compare it, though, to Terminus, and there’s a story whose storytelling is all over the shop (despite its merits, of which, contrary to popular opinion, I think there are several). And because we haven’t done a listicle in while, let’s list the 7 deadly storytelling sins in Terminus. Too many characters. 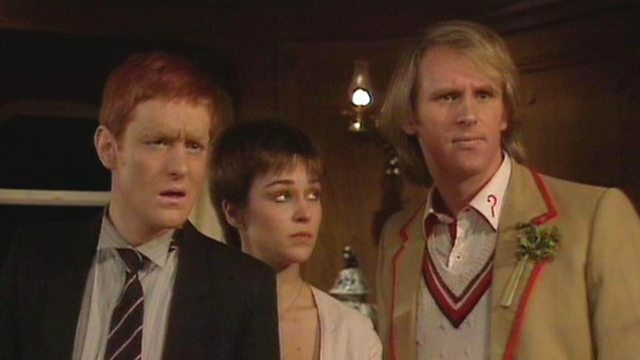 Most obviously illustrated by the way that companions Tegan (Janet Fielding) and Turlough (Mark Strickson) are relegated to clamber through miles of underfloor ducting for the whole story. 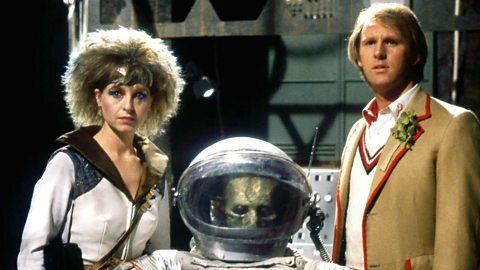 What makes this even more annoying is that there are two surplus characters: glam rock space pirates Kari (Liza Goddard) and Olvir (Dominic Guard). Their contribution to the plot is minimal and there’s no reason their places couldn’t have been taken by Tegan and Turlough. Then we’d have had a story which involves all the regulars substantially. And in Turlough’s case, this would have kept him closer to the Doctor. Given that his character’s whole raison detre is to kill the Doctor, it might have helped to have actually been within chucking distance of him. 2. There’s no villain. The story tries to cast our suspicion on the Vanir, a group of disheveled men who act as porters for the cargo of Lazars destined for treatment on board Terminus. But as it eventually pans out, the Vanir are simply drug addicted slaves. The real bad guys are here at the Company, the Vanir’s employers and Terminus’s operators. They are the ones who process the Lazars without care or satisfactory cure, (presumably for profit) and they are the ones who keep the Vanir enslaved through the supply of glow sticks of their drug of choice, Hydromel. Problem is, we never see anyone from the Company, so we have no-one to epitomise the threat they represent. Think, for example, of the Tom Baker story The Sun Makers, where the odious Collector represented all that was corrupt in that enslaved society and gave us a villain to hate. There’s no such figure in Terminus, only a half-hearted attempt to build up the character of Vanir leader Eirak (Martin Potter) into a ruthless bully, but in reality, he’s just as big a victim as everyone else on this ship. 3. The problem Nyssa wants to solve isn’t shown. Nyssa (Sarah Sutton) contracts Lazars’ Disease which makes her pale and weak and too hot to wear anything but her underwear. She’s manhandled into the big furry paws of the Garm (RJ Bell) whom we’re led to believe will torture her. As it turns out, the Garm actually administers the treatment which cures Nyssa, but she’s not grateful. The treatment, she says, is haphazard. Some live and some die, but for those who live the treatment might lead to unforeseen secondary illnesses. The process needs refining, she says. But we’re told all this, never shown it, so it’s hard to visualise what the problem actually is. In fact, the only thing we do see is Nyssa being cured, which seems to suggest there’s no real problem here. 4. The big bang plot is unconnected to the rest of the story. Throughout the story, the Doctor (Peter Davison) is intrigued about Terminus’s position at the exact centre of the Universe. This doesn’t seem to worry anyone else, but later he deduces (somehow) that the explosion of Terminus’s engines millennia ago caused the Big Bang, and a second impending explosion may cause its destruction. Cue Part Three cliffhanger! Then the doggy Garm comes and flicks a big red switch and it’s all fixed again. Then it’s back to the main plot about the Lazars, which is completely untouched by all this flim flam. (For other, more relevant, instances of destructive, history altering events, see The Visitation, Earthshock and indeed City of Death. That can be our LINK). 6. Its climax is hugely unexciting. Because there’s no real threat or villain to overcome, everyone just agrees to Nyssa’s plan to synthezise some Hydromel (in a home made meth lab, I presume) and start a hospital. Eirak is outraged a bit, but that’s all the resistance it meets. It’s a quiet, drama-less revolution. 7. It’s too long, but somehow still runs out of time. It’s quite a feat, but this story maintains a gentle languid, pace during Parts Two and Three, with much corridor wandering and aimless chatter. But suddenly, half way through Part Four, it seems to run out of time. The Vanir, including the previously belligerent and murderous Valgard (Andrew Burt) are swiftly won over. There’s no time to explain how Kari and Olvir will get back home. A quick goodbye to Nyssa and suddenly we’re back to the TARDIS for a closing snarl from the Black Guardian (Valentine Dyall, see problem 1). In short, its pace is all over the place. Now cast your mind back to City of Death. The right amount of characters, a clear and present threat, no unnecessary subplots, a strong climax… you get the idea. It’s just a better told story than Terminus. In fact, all of season 17’s stories are better told than Terminus. It’s just one comparative example – there are many other stories both better and worse – but when we look at story telling which is genuinely a mess, we can see that Adams wasn’t half bad at his job. NEXT TIME: Build high for happiness. We move into Paradise Towers. ERIC SAWARD: Johnny! Thanks for coming in. JOHNNY BYRNE: My pleasure, Eric. How’s the new job coming along? SAWARD: Oh fine, fine. Just settling in, really. BYRNE: How are you getting on with the producer? SAWARD: Oh very well. I’m sure we’ll be the best of friends. Right now though, I’m looking for scripts for the new season. SAWARD: And I enjoyed that Traken one you did for Tom. And seeing as we’re paying you every time we use Nyssa, I thought might as well put you to work, eh? Eh? (Awkward silence) Anyway, did you have any ideas? BYRNE: Well, yes as it happens. I’ve been thinking of a story about a creature from another dimension, who’s trying to force its way into our universe. Have you read The Mist? SAWARD: No. But your idea sounds great! Before you go too far with it, there are a few bits and pieces we’d like you to… incorporate. SAWARD: Well, you did such a great job of bringing back the Master, and it is the show’s twentieth anniversary, how about bringing back Omega? SAWARD: Omega is a kind of Time Lord demi-god who exists only in a universe of anti-matter and who appeared in the tenth anniversary show. Have you seen The Three Doctors? BYRNE: No. But I can see how that will fit into my story. An immensely powerful being, but poison to his own kind. He’d be a kind of lonely outcast once he got into our world… Maybe he’d meet a little boy, and rather than kill him, be entranced by his innocence… have you seen Frankenstein? SAWARD: No. But that all sounds terrific. Of course, it will need to be set in Amsterdam. SAWARD: The producer wants to shoot overseas somewhere. And we get the cast and crew to buy their own meals and travel everywhere by bicycle we can just about afford to go to Amsterdam. SAWARD: No honestly, it’ll be great! They went to Paris a couple of years back and it was brilliant. The Louvre, the Eiffel Tower. Much better than some old country manor or disused warehouse. Have you seen City of Death? BYRNE: No. But Amsterdam, doesn’t have those iconic fixtures like the Louvre and the Eiffel Tower. What has it got? BYRNE: Not really Doctor Who territory is it? Tulips? BYRNE: I seem to remember that it’s below sea level. Maybe that becomes important to this Omega chap because it’s somehow necessary to his plan for emerging into this universe. SAWARD: Great! Use that! It will need a monster of course. BYRNE: Will it? Won’t Omega do? SAWARD: Oh no, no no! He’s just the villain. We’ll need a monster too. IAN LEVINE (OOV): Omega can conjure up monsters simply using his own will! SAWARD: Nothing, just ignore it. But yes, Omega can create his own monster. BYRNE: Hmm, maybe a henchman type of thing. Created from the raw matter of the universe. All flesh and sinew but covered in an exoskeleton. Have you seen Alien? SAWARD: No. But that sounds just the ticket. BYRNE: Can the budget manage it? We don’t want it to look like, oh I don’t know, a big rubber chicken. Ha ha. SAWARD: Ha ha. No, that’ll never happen. BYRNE: Is there someone behind that door? SAWARD: No, of course not. But that’s the other thing – we want to set some of it on Gallifrey. That’s the planet of the Time Lords. BYRNE: What’s that like then? SAWARD: Oh, it’s terrific. All gothic chambers and big impressive cathedral-like spaces. Have you seen The Deadly Assassin? SAWARD. Just as well, because we won’t have any money for any of that after we go to Amsterdam. A few corridors, some space boardrooms and a few lounges will do. BYRNE: Sounds lovely. Well, we can do some court intrigue stuff there. The Doctor summoned home to be executed. A traitor in their midst, that kind of thing. Have you seen I, Claudius? LEVINE: Don’t forget the temporal grace! LEVINE: In Earthshock, guns were fired in the console room, but it’s meant to be in a state of temporal grace! We need a line to cover it! SAWARD: No problem, we’ll do something about that. LEVINE: And if the Doctor’s going home to be executed, we should say that’s only the second time that’s happened! ‘Cause it is y’know! LEVINE: And you should call one of the characters Colin! That will give you a handy LINK to the 1966/7 story The Highlanders! BYRNE: What an odd thing to say. LEVINE: Have you seen The Highlanders? LEVINE: Of course you haven’t! How could you? It was junked years ago! SAWARD: (leading him to the door). OK, thanks Ian. LEVINE: And mention Romana! And Leela’s wedding! BYRNE: What an extraordinary fellow. Who is he? SAWARD: He’s our unpaid series continuity adviser. BYRNE: You have an unpaid series continuity adviser? LEVINE (OOV): And bring back Tegan! SAWARD: Oh, that’s right. We need to bring back Tegan. She’s a companion we don’t pay a regular fee to use. She’s coming back after we dropped her off in the last year’s finale. Have you seen Time-Flight? SAWARD: It’s, um… Well it’s really something. And the same director’s going to do your story. BYRNE: Oh that is good news. SAWARD: Great. Well, I’m sure you’ll do a terrific job on it. Thanks for coming in, look forward to the script and I’ll see you NEXT TIME. BYRNE: Super. How do I get out again? SAWARD: Straight out this door – mind our unpaid series continuity adviser – and Turn Left.